Nope. No idea how Norwood will do in this game. Have we been lucky so far or do we win close games because of talent. We will find out tomorrow but with our lack of scoring ability our defence better be on song. Hope Brady Dawe is fit because he is our only tall in the forward lines who may be able to kick goals. 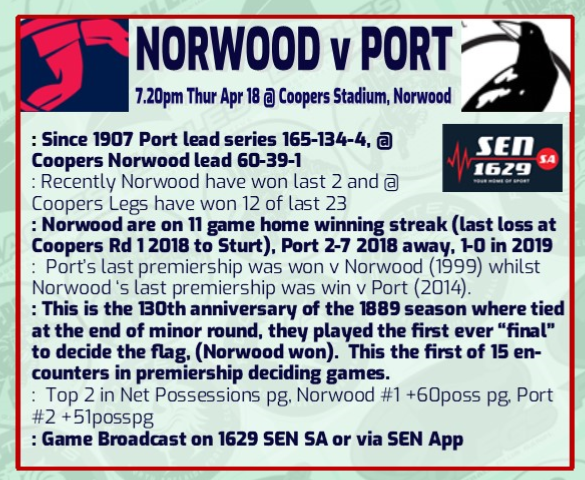 Norwood has regained two vital players for its clash with Port at The Parade on Thursday night. Star midfielder Matthew Nunn (illness) and triple premiership forward Brady Dawe (hip) have recovered to be included in the Redlegs’ 23-man squad. Nunn’s presence takes on more importance in the absence of dual Magarey Medallist Mitch Grigg, who accepted a one-match ban at the SANFL Match Review Panel for striking Sturt’s Steven Slimming on Friday night. Promising youngster Dylan Stephens is on duty with the AFL Academy, paving the way for another two possible RAA Rookies in Brodie Carroll (19, 186cm and 77kg) and Cameron Taheny (18, 185cm and 80kg). Carroll, a mdeium-sized defender, and Taheny, a medium-sized forward, have both been named on the extended interchange bench. Port Adelaide has named a surprise inclusion for the blockbuster against Norwood on Thursday night. Clever goalsneak Steven Motlop will play his first SANFL match in any grade since fronting for North Adelaide’s Under-17 team in 2007. He has been joined in the Magpies’ line-up by wingman Karl Amon, who has recovered from a knee injury while Dallas Hill, Matt Appleton and Jack Elsworthy have also been included in the 21-player list. A host of Power-listed players have been called up to the AFL squad, including potential debutant Peter Ladhams, forward Todd Marshall and ex-Brisbane Lion Sam Mayes. D. Johnston, Olsson, J. Wilson, J. Richards, Willhelm, Martin, Collins, Spence, Crauford, Heard, Miller, Saywell, Nall, Millman, Crompton, Fahlbusch-Moore, Pascoe, Hay, Charlton, Di Stefano, Coles, Grove, Barnett. Baker, Beenham, Colwell, Elmes, Fairlie, Freitag, Heaslip, Helyar, Hoey, Illingworth, Juckers, Kappler, Kennedy, Lovering, Manuel, McGree, Milsom, Neville, Sladojevic, Snelling, Whitbread. Belperio, Nelligan, Morris, Cavallaro, Trepka, Kudra, Saunders, Lanzoni, Murphy, Falco, Tranfa, Fairbrother, Warton, Carroll, Higgins, M. Roberts, Ianniello, Carbone, Porter, Bartlett, Carey, Duke, A. Roberts.